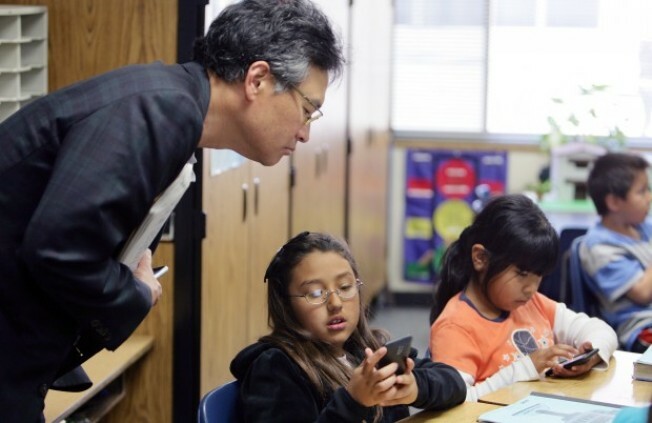 Milton Chen, director of the George Lucas Foundation, watches as 9-year-old Eliza Pedro demonstrates how she utilizes an iPod Touch in her studies Friday morning at Central Elementary School in Escondido. Popping number ballons are bouncing around the screen with addition, subtraction and division problems. Kids are racing one another to be the first to add a missing letter and complete a word. Are these children playing or learning? Educators at Escondido Union School District say both. 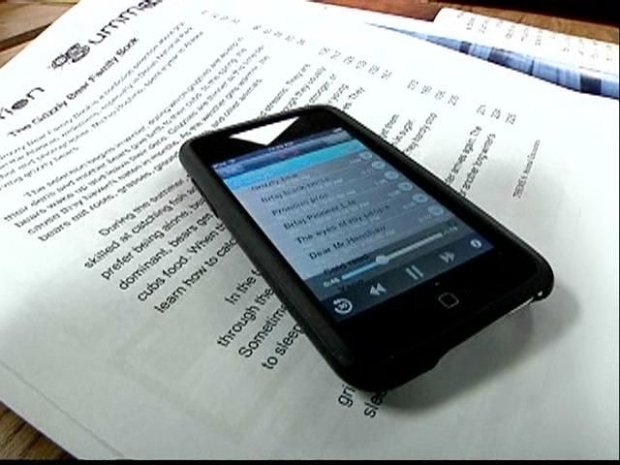 The district has won a prestigious award for its use of iPod Touches in a program credited with improving test scores. "We're seeing it across the board," district technology and media services director Kathy Shirley told media partner the North County Times. "In all the classrooms where we have [one iTouch for each student], the kids are outperforming the control groups." The Escondido School District is being recognized for its iPod program. The Escondido Union School District, which serves grades K through eight, provided students with about 1,600 personal iPods, including at least 1,000 iPod Touches. The district has been using iPods for about four years, but now 26 classrooms are using iPod Touches in a one-to-one environment. In a test group of fifth-graders who are learning English as a second language and who are classified as "high poverty," student test scores in reading skills surged during a six-week period between last December and January, Shirley told the North CountyTimes. Several students jumped from far below basic skill levels to above "proficiency" in some categories, she said. In another study, students using iPod Touches for math skills showed the equivalent of two years of growth in six months. On May 20, the county Office of Education is scheduled to present the district with the Impact Award from the Classroom of the Future Foundation for its commitment to technology. The award, which comes with a $10,000 grant, is the highest of four given annually by the foundation.